Feeling Great on the Eve of Juneathon. You really know that you have returned to full training when you have to duck into a field of corn, hundreds of miles from home, just to relieve yourself. And there, hunkered down and praying that a rat doesn't emerge to bite you on the backside, or that the farmer doesn't come to check his crop, it is easy to see how running becomes the most primal of all our activities. Yes, six and a half miles at least (no garmin or mile measuring device here I'm afraid), of sheer country running up in my wife's home county of Louth brought nothing but a feeling of loose freedom. This weekend I also drank pints number 13 and 14 of the year, with Aidie in the Cross Bar. This was a bit naughtier than usual because I am supposed to be on a strict Liver Cleanse from the Wholistic Clinic but the occasion called for it and my schedule can take the change. I'm looking forward now to a summer of hearty running and good holistic living! 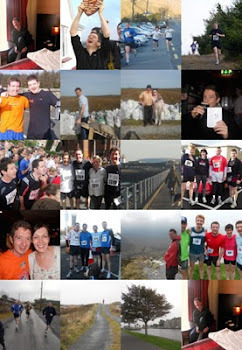 I'll sign up to the Dublin Marathon any day now - once the committment is made there is no turning back! 3 miles, no watch, good pace. Being short on time, I decided to go for a short but slightly fast run this evening. Once again the Galway Prom was the backdrop to my ongoing return to full training. Drinking silage (ok, its actually a drink called 'synergy' but tastes like I imagine silage would...) has paid off - I am actually back to full health for the first time in months. So the new me, Wholistic Bren, not only constrained to 24 pints for the year but now also giving up the other joys of life such as coffee and chocolate, went for a short and fast run and felt great. Hurrah. A week ago, in a last ditch effort to rid myself of this bug/lethargy, I took a friend's advice and went to a Wholistic Clinic. I walked in looking for a quick acupuncture cure and walked out as a signed up member of the Wholistic Community. This means: no tea, no coffee, no bread, no salt, no milk, no sauces of any kind and no sweets or ice cream! Worse than that it means consuming all manner of horrible drinks from flax oil to a synergy drink that I can only describe as mixing silage with water. Apparently my liver needs serious cleansing, as do my kidneys and my spleen and... I have basically been abusing these poor fellas for the past number of years and now they are finally having their own back by refusing to do their work. The UOB (Union of Organs Bhreandáin) held an annual general meeting in my stomach a month ago and elected to go on strike, and there you have it - I started feeling very run down and my running suffered. ANYWAY... I went for a nice four mile run today on the Galway prom, after work . The weather was glorious and the beach was packed with people who couldn't believe their luck. The weatherman says that rain is coming, somehow I don't mind. I'm reading a book called 'Born to Run' at the moment, which is giving me a good bit of encouragement to take up barefoot running - it may help to alleviate some recent knee pain? Shoals of mackerel, sweet and healthy - hopping out of the water, begging to be caught by line and rod. And no better man to catch them than myself (this is not arrogance, actually there was no better man to catch them because I was entirely on my own!). Sea angling is the perfect mix of peace and excitement as you are being hypnotized by the constant lapping of the Atlantic against the rocks and then all of a sudden the tug of mackerel on the line gets the blood running! It's a bit early in the season so I had the rock entirely to myself - beautiful place in the best of time but tonight topped all. On running matters: I am aiming to do a four miler tomorrow or Sunday (jaysus the thought of doing a run every day in June for Juneathon is a tiny bit frightening now). Hopefully the mackerel will act as running fuel? I was out for a stroll yesterday evening, down by the old pier and lighthouse in Pointe when I noticed a neighbour out at sea in his currach (note to those not from this part of the world: this is an old type of Irish skin boat/canoe)! He was casting some lobster pots into the sea and leisurely making his way back to the pier so I went down to help him tie his currach up. In return for my very small help this neighbour (Johnny) gave me two large fish (wrasse). My wife and I love fish so I reckon I'll be loitering around the pier from now on in the hopes of getting some more! The Best Run in the World. Ever. You inland runners can go for a Burton as far as I'm concerned, for there is no greater joy known to running man than a 5mile leisurely along the Galway prom, with the Atlantic Ocean roaring you on, the Burren and the Aran Islands keeping and eye out for you and the buzz of walkers and strollers at every twist. And so it was yesterday evening, with a couple of hours to spare after work and before a 'come dine with me' dinner date with Rónán and Máirín, that I togged out to run along this famous stretch. There was a time when I used to sneak off for a quite pint after work - paper under the oxter and a solid excuse at the ready (yes I do know that my wife also reads this blog but trust me, she only laughs at my stupidity), however, these days I resort to sneaking in a 'run'. It was a touch misty yesterday but with no real wind it was a lovely day for it. I started at the mid-way prom point, ran out as far as the gates of Mutton Island Lighthouse, doubled back, did a loop of South Park, returned to my car and then headed in the other direction. A little over five miles (I mentally calculate - no garmin, I will explain why in another blog!). It feels good to be getting a few runs in again following the bug from hell. A word about our 'come dine with me' experience - this Máirín woman is a ridiculously good cook and has raised the bar for next Wednesday's event, where I am host. Time to get sneaky with chinese takeaway? Stop the press: SICK BOY MAKES SLOW COMEBACK IN CLARINBRIDGE! I may not have slept with several hundred cocktail waitresses and I may not be the face of gillette razors but I too have made a comeback, and for Tiger's US Masters, read my: Clarinbridge 8k! It was a perfect day for running - nice and bright, not too hot, not too cold, no rain and no wind! The run started on the grounds of an old Irish 'big house', set in the middle of a wooded area. For me this was all about getting a 'run in'... there will be plenty more days for PBs! Speaking of PBs - I travelled down with Rónán who did this 8k in a ridiculous time of 31minutes! He was out of sight before we even left the woods to get on to the road part of the run. Basically, the route started with a trek through the woods, followed by a few kms of road, and then back into the woods again for the last three or four kms. The course wasn't difficult - no major uphills, but the wooded part was rough under foot which evened out some of the easiness of it. I deliberately, ran within myself because I was wary of my lack of training over the past five weeks, and the fact that I was getting back after shaking off a bug... however, that's not to say that I didn't feel the burn for the last 2kms, but nothing major. I finished in 43.06mins, which will do me nicely. Really enjoyed it all and big thanks to Máirín, Rónán, Marcus and Cóil for the day out! Ron B, Chased by Sumo, Breaks All Records! I couldn't not put up a pic of Rónán who stormed home in record time in the Kildare Half Marathon, wearing some fat man's top. I can only imagine that he ran as fast as he did (1hr30.17) beacause the Sumo Wrestler that owned the top was actually faster than he looked and chasing him at pace! Well done Burgandy, well done! I have just reviewed Foe, a 20ish year old novel by the great J.M Coetzee. See the right column of this blog! A very slow three miler. First in over a week. Felt sluggish and tired at first but ok by the end of it. Hopefully this is the end of that aul' bug I had... 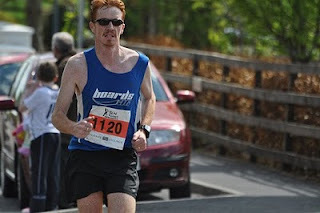 There is an 8k in Clarinbridge on Sunday that Rónán and the lads are running so, providing I get another trot out on Friday, I'll consider doing that slowly. The comeback is on. Again. The blogs have slowed down, along with the runs, and for that I truly apologise to my blog God in the Sky (whose name, by the way, is Vorlong the Brave, All Hail). Any way, this past month has been the worst as regards running and also drinking - my other great blog purpose! I have had a constant bug - finally went to doc who told me it was a 'viral infection', and I have drank half my year's schedule, with only slightly over a quarter of the year gone! However, I hope to be back on running track before the end of the week and I am confident that I can bring the drinking schedule back into good order. Once again, All Hail to Vorlong the Brave, I beg Thy mercy for all of my inconsistancies, oh Great One. When I say half way through, I am referring to the pints total and not the year. I am now officially behind schedule following three more impromptu pints on Sunday night. The truth is that we had a stressful evening in Louth and when things died down my father-in-law asked if I fancied a pint in the local. I couldn't really tell him that my schedule didn't allow! So 12 pints down and 12 to go!!! Also, I haven't run for the past week, so I will trot out tomorrow to hope, yes hope that this strange bug of mine has gone! Next race target now is the Clarinbridge 8k, on Sunday 16th May. Something to aim for!